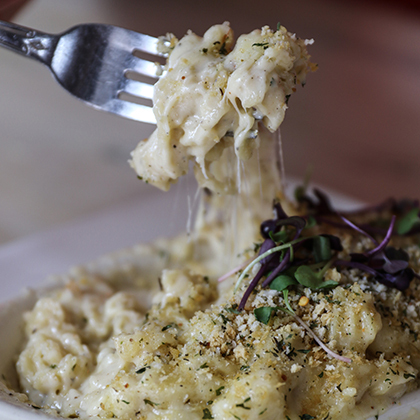 One of the beautiful elements of mac & cheese is its versatility. You can dress it up, you can dress it down, you can deconstruct it, and you can utilize any number of cheese combos. 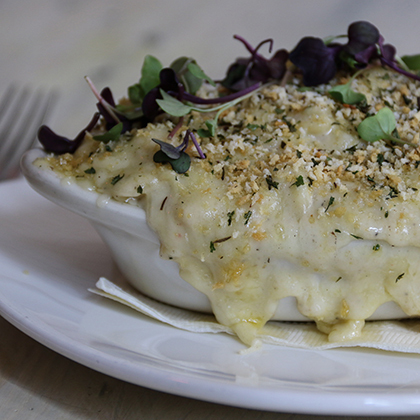 But the mac & cheese to measure all others against is the classic version done right. And that’s exactly what this one is. 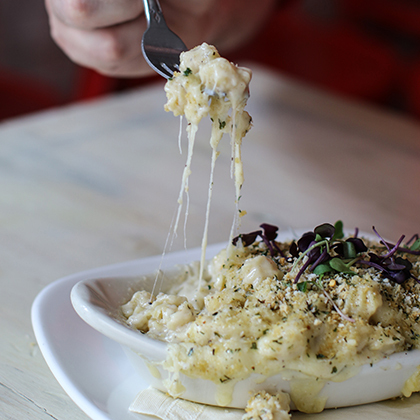 We use a mixture of four different cheeses, a fine balance of spices, and just the right ratio of breadcrumbs to create a nice crunch on the top. Because this is a classic version, it also provides an excellent base to riff of when you’re feeling like experimenting with some other ingredients. Grate all cheeses and combine. Pre-heat your oven to 350°F. In a separate saucepan, melt the butter and add ½ clove grated garlic. Slowly add the flour, whisking to combine, and cook for 2 minutes. Ladle in the warm milk, whisking constantly, until combined and smooth. Add the nutmeg, black pepper, and cayenne pepper. Add 5 ounces cheddar, 5 ounces Taleggio, 3 ounces Fontina, and 3 ounces Gouda. In a separate pan, bring water to a boil and add salt. Add the macaroni and cook until tender. Strain the macaroni and place in a bowl. Add the remaining grated cheeses and toss to combine. Bake in a 350°F oven for 20 minutes and serve immediately.